Traditionally, steel has been the main material used in the automotive industry. However of late, the shift towards electric motors for comfort and safety has increased the popularity of lighter metals such as aluminum and magnesium, to counterbalance the resulting increases in vehicle weight. Present day research does not focus only on electric vehicles, but also on hybrid cars with heavy batteries for their electric motors, as well as traditional engines with low fuel consumption. Technological advancements necessitate the need to seek lighter and lighter materials without sacrificing the required stiffness over a broad temperature range. Figure 1 shows the use of carbon fiber reinforced plastic in the automotive industry. These high-modulus composites have proved their performance in the aerospace and aircraft industries. However, cycle time for producing car parts are faster and the thermosetting resin must cure in just few minutes, not few hours. The DMA method is focused on analyzing the viscoelastic properties of polymers. The damping behavior and stiffness are determined under an oscillating force as a function of time, frequency and temperature. The dynamic mechanical analyzer DMA E Artemis offers a highly precise Young’s modulus for all composites across the temperature range from -170°C to 600°C. The measurement results in Figure 2 shows the storage modulus E' (green curve), loss modulus E'' (red curve) and loss factor tan5 (blue curve) for a carbon-fiber reinforced epoxy resin as a function of temperature. The measurement of a lamellar sample was performed in 'bending mode' at a frequency of 10Hz and a heating rate of 3K/min. Before reaching 120°C, the material is even stiffer than titanium, at 140000MPa. At 158°C (extrapolated onset temperature of E'), the modulus drops due to the glass transition of the epoxy matrix. The corresponding peaks for E'' and tan5 are at 180°C and 188°C respectively. 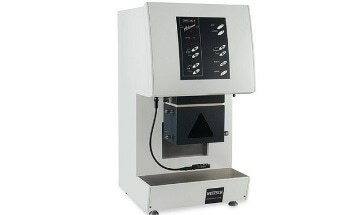 The DMA 242 E Artemis, as shown in Figure 3, offers a number of benefits in research and development, quality control and failure analysis of composites. The modified single cantilever bending sample holder with free push-rod as shown in Figure 4 guarantees quantitatively high storage modulus values (E') at low damping values (E'', tan5). The sample here is fixed tightly at one end and a free push-rod oscillates at the other end with a superimposed static force. For data acquisition, Fourier transformation can elicit highly sensitive and accurate deformation amplitudes and the exact phase shift. The signal-to-noise ratio is improved by this digital filtering to one order of magnitude without any phase lag, as compared to the conventional analog technique. The 5-dimensional system stiffness calibration routine for sample holder type, dynamic force, deformation amplitude, frequency and temperature considers all influencing factors from the DMA setup. Even the phase shift of the DMA electronics is taken into account by means of "rotation tuning". This provides low tan5 values for extremely stiff materials such as composites, metals and ceramics.